I can’t believe it’s Christmas time again. 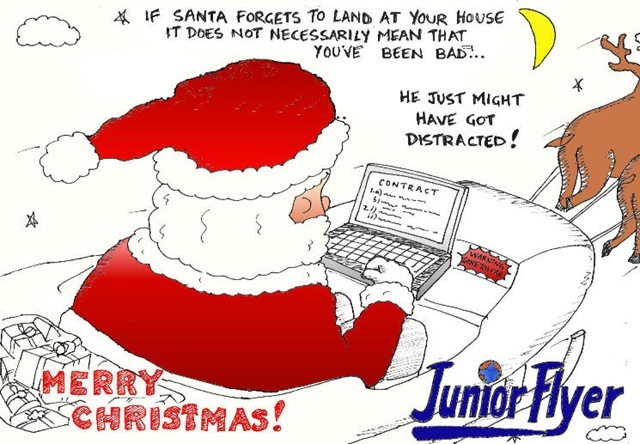 Our thanks to the folks at Junior Flyer for this great Santa graphic too. Scott and I are going to take the rest of the week off to hang out with family, but we both wanted to leave you with a couple of cool things to keep in mind this week while you wait for the arrival of the big guy. 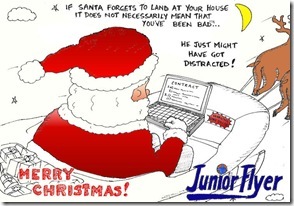 First there’s the NORAD site that tracks Santa on the way to your house. Great fun for the kids. It also brings new meaning to use of the phrase bio-fuel. And as they approach the North Pole on the way home, they need not worry about the weather as long as their Electronic Flight Back (EFB) is equipped with the proper North Pole approach plates. Although the folks at GE are very proud of their new Green sleigh for Santa, the union representing the reindeer flight crew are not at all happy about the job losses the new vehicle might well create. Finally, what would Christmas be without a good FAA flying joke. Santa is about to take off on Christmas Eve for his annual ride when an FAA inspector approaches him in front of the hangar. “How long has it been since you’ve flown this sleigh,” he asks the Big Guy. “Exactly one year tonight,” Santa replies. “Well,” says the inspector, “I’d say you’re out of currency. We’d better take a ride together. Wondering of course whether he did indeed turn in his paper certificate for a plastic replacement, Santa invites the inspector aboard. Being pretty quick, Santa couldn’t help noticing the 45 strapped to the inspector’s belt. “Why would you need a gun on a checkout flight?” Santa wondered. Merry Christmas to everyone around the globe. Thanks for reading Jetwhine in this, our third year. This entry was posted on Sunday, December 20th, 2009 at 11:00 pm	and is filed under The Buzz. You can follow any responses to this entry through the RSS 2.0 feed. Both comments and pings are currently closed. Distracted pilots, inconveniently timed fed rides, and labor union struggles. Sounds like business as usual in the industry. Merry Christmas Rob, et. al. I notice that the approach plate is dated 19 Dec 2004. Is it still current? Merry Christmas to all of you. Thanks for a great 2009. Rob, Wishing you a happy and safe holiday! So you noticed that out of date chart huh. Rats. Yep. And I am neither a pilot nor a controller. Just a retired FAA Electronics Technician. But, contrary to popular opinion, I can read. Merry Christmas to all. And a happy new year as well.